Observation - Collared Dove - UK and Ireland. 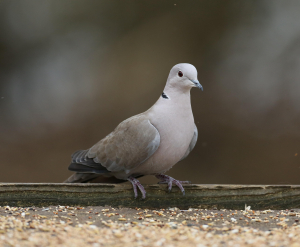 Description: Collared Doves seem to me to be extremely dim birds, second only to Pheasants. I can't count the number of times I've nearly run them over (I hasten to say that I've never hit a single one of either bird, though I don't know how. Good brakes, I think). Collared Doves seem to me to be extremely dim birds, second only to Pheasants. I can't count the number of times I've nearly run them over (I hasten to say that I've never hit a single one of either bird, though I don't know how. Good brakes, I think).